What year did your Company/Business get started? We took over ownership of Advanced Automotive in 2013 from the previous owner. Advanced Automotive had been in business for over 20 years previously. 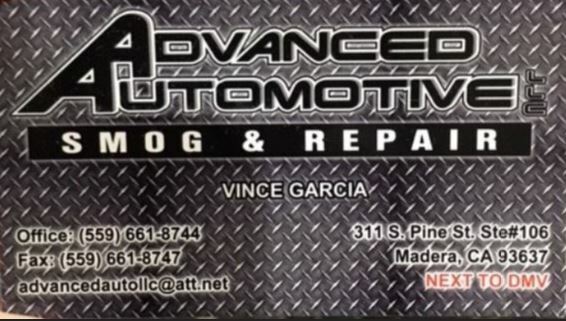 Advanced Automotive is an all-around auto repair and smog shop. We are one of the few shops in town that works on and service light duty diesel trucks (Ford, Dodge, Chevy). We have a very wide customer base. We always welcome any customers and strive to do our best! We also maintain and service multiple fleet accounts, including: agricultural, school districts, city and county contracted work. Yes, we are family owned and operated. My wife, brother and I.keep things running smoothly alongside our great mechanics. New equipment, new computer programs. We utilize social media for advertisement, check us out on Facebook , Instagram and Google!